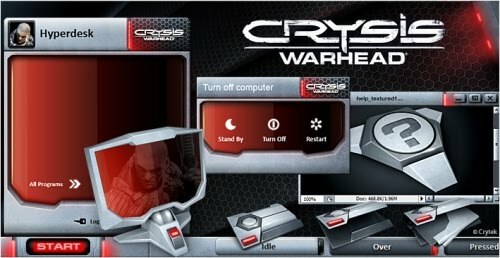 Armored drive icons, illuminated Windows start menus, custom windows, buttons and dialog boxes, a nanosuit-inspired custom wallpaper, the Official Crysis Warhead Windows XP desktop theme from Electronic Arts, Crytek, NVIDIA, Ultra PC and The Skins Factory, has it all. Turn your plain old XP desktop into a Crysis Warhead desktop. Features 3 themes, 15 icons and an ultra-cool wallpaper. Did we mention it's free to download! Execute the installer and enjoy. NOTE: The desktop theme only works with Windows XP 32Bit (SP2,SP3) and the installer depends on the language. Either download the English Windows XP installer or the not English Windows XP installer.